A handheld device is adapted to perform non-contact measurements to determine distances, angles, arc lengths and radii between select points on physical structures. The device is assembled and contained within a handheld, portable housing and includes various control and input keys, a visual display and three laser components. Each laser component includes a laser emitter including a laser emitter diode with an associated emitter lens. The laser emitters of the three laser components are set at fixed, predetermined angles relative to one another at the front end of the housing. Each laser component also includes a laser receiver with an associated detector lens correspondingly positioned in alignment with the emitter lens. The laser components are adapted to emit and receive light signals to collect image data representative of a straight line distance between a predetermined set point within the device and a point on the surface of the measured structure. A processing unit receives the image data from the three laser components to determine straight-line distance measurements. These measurements are used in conjunction with known angles between the three laser emitters to perform calculations that determine distance, angle, arc length and radius of the physical structures. 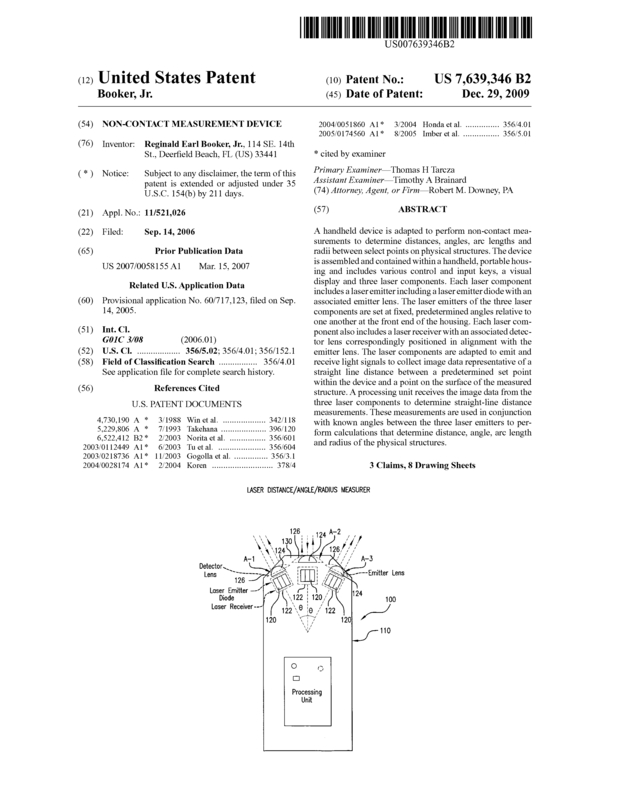 Page created at 2019-04-26 18:28:00, Patent Auction Time.